This guide was made while playing in Normal mode. The strategy presented in this guide is just one way to play and there are other methods that work as well. 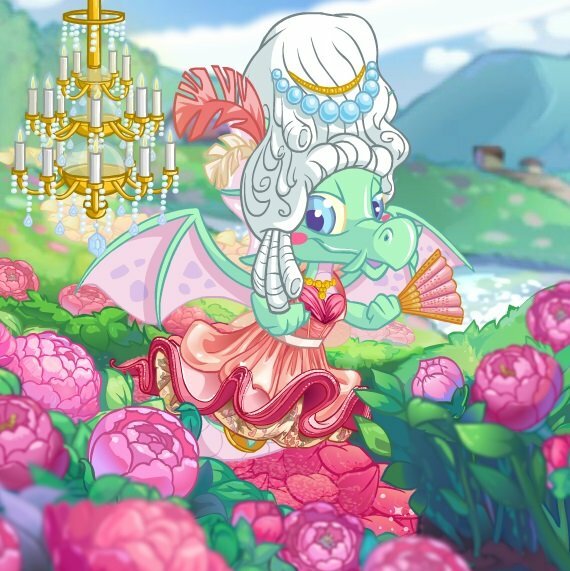 This is just a good way to get used to the game! In this game you are basically playing as Hagan. Skarl is after your cookies and you must protect them from him. 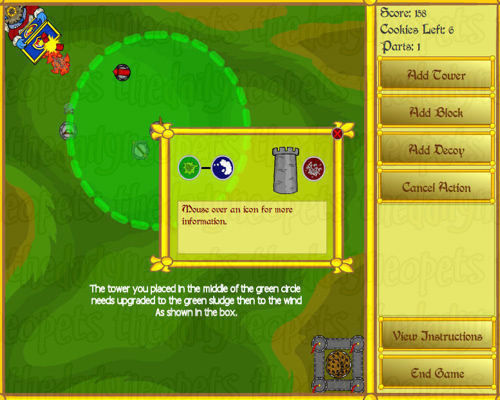 He will send his toy soldiers after your cookies and you need to use towers, decoys, and blocks to keep them away! You start out with 24 parts and 6 cookies - remember this is in Normal mode. A tower costs 2 parts. 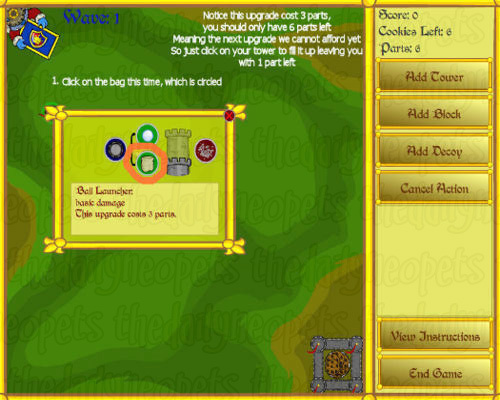 The first upgrade, either to a bag launcher or a ball thrower cost 3 points. The second upgrade under ball launcher costs 4 parts. That is either a slingshot or a cannon. The second upgrade under bag launcher costs 4 parts. This is either a oil thrower or a sludge thrower. The third upgrade under slingshot costs 5 parts. This is either a potion slinger or a crossbow…I call the crossbows arrows. 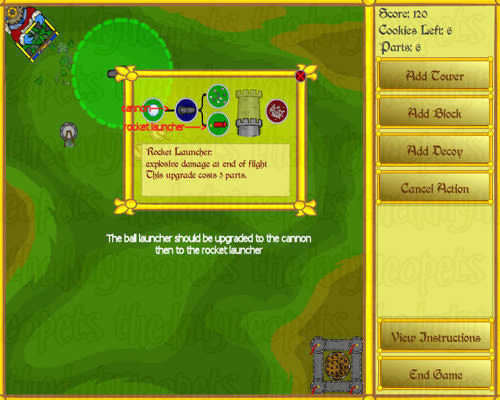 The third upgrade under cannon is rocket launcher or gravel cannon. These cost 5 parts as well. 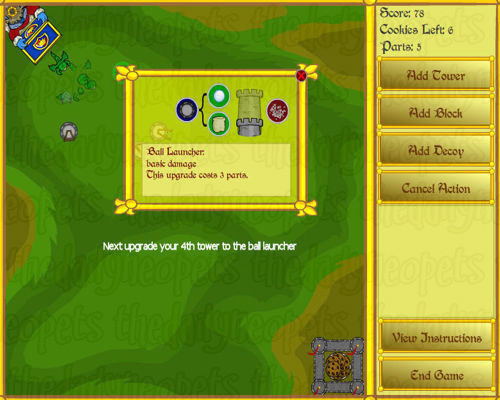 The third upgrade under sludge thrower is either a net or a windmill. The third upgrade under the oil thrower is either a paint thrower or water thrower. These all cost 5 parts. Now you can also increase the height of your towers. This is important to do! 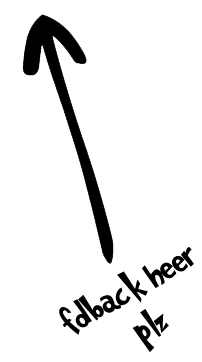 You can increase the height twice and each time costs one part. The decoy is a fake cookie on a plate. You can place these around wherever you want. However I don't use them at all. I don't find they help much. Decoys cost 2 parts. Blocks can also be placed around, they can block enemies. However I don't find these that helpful either. BUT I do use these if an enemy steals my cookie and gets it out of my little castle. 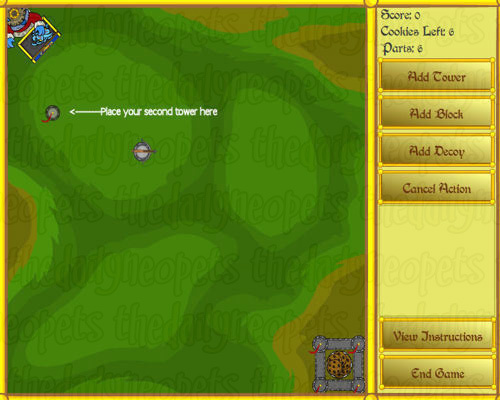 I place 4 blocks around my cookie, you will see a picture of this later in the guide. These can also be helpful to "fill in" the holes in your castle if an enemy does break through. Blocks cost 1 part. You gain more parts as you destroy soldiers. The more you destroy the more parts you will get. 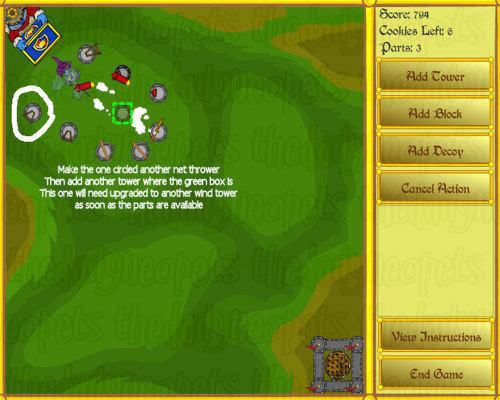 The mouse is the control used for this game. You just simply left click on everything! First I put a tower right in the middle of where the box is. You can see in the picture where to put it. 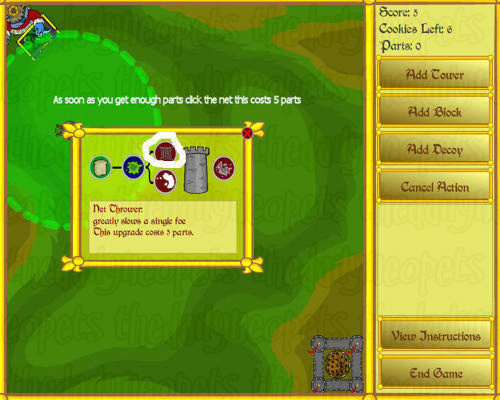 You can put it a little closer to Skarl, but not too much closer or the range will be messed up. 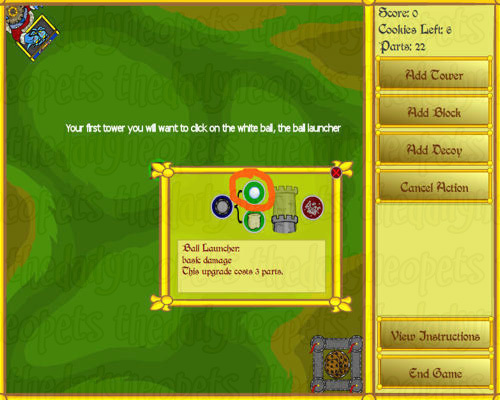 Next chose the ball launcher, the ball launcher is the top option. It is circled in red in the picture. After chosing the ball launcher I then chose the slingshot it is the top option once again. Now I always chose the crossbow (I do refer to this as an arrow sometimes) for this tower. I find it does a great job killing the enemies as they come marching towards the tower! 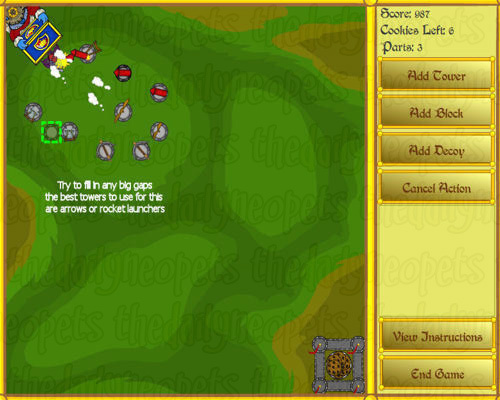 Now after upgrading to the crossbow make sure to click the picture of the tower on the right, click it until the shaded part of the tower is no longer shaded. 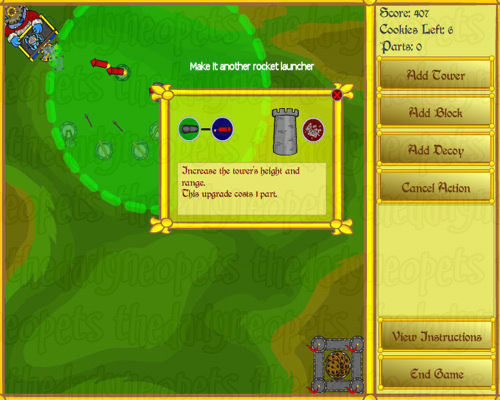 This makes your tower the tallest it can be and gives you a larger range to shot enemies. Next you will need another tower. 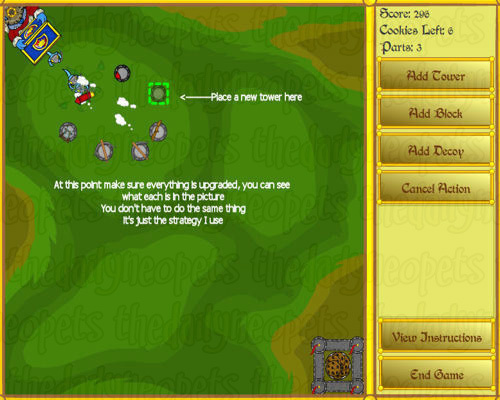 Place this tower to the upper left of the tower you have already created. The picture shows you the best placement for this tower. Now you need to make this tower a bag launcher. Once you upgrade to a rocket launcher you are not able to upgrade to the next level of weapon because you do not have enough parts. However make sure you upgrade the height of your tower and fill it all the way up! This image shows the bag launcher hitting a soldier and smashing it into pieces! Pretty nifty don't you think? 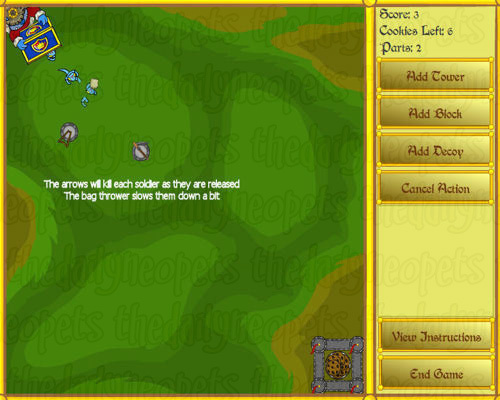 The arrows do a wonderful job stopping these enemies from getting to your cookies! 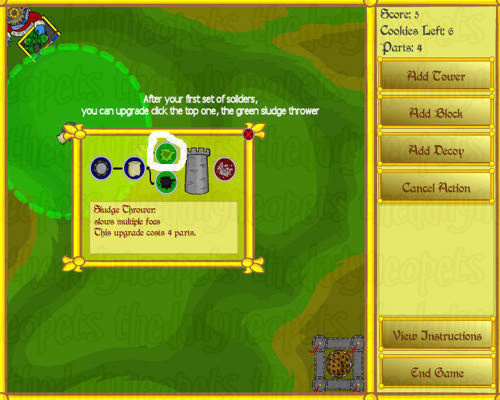 Now after the first wave of soldiers you can upgrade your bag thrower to the sludge thrower, which is circled in the picture. Now you just wait until you have enough parts to upgrade to the net! That is the top icon and is circled in white in the picture. Nexts do a great job slowing down the soldiers making them a lot easier to kill. This picture shows the arrow and the net working together! 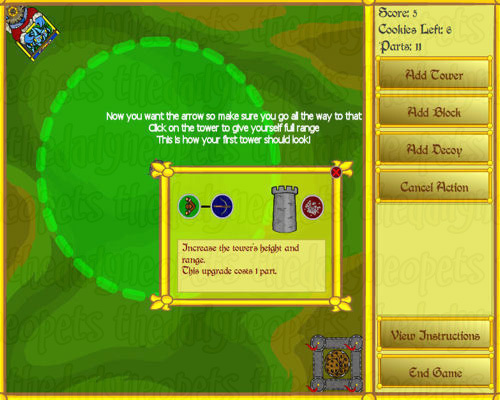 The third tower should be placed to the right of the crossbow that you placed first. 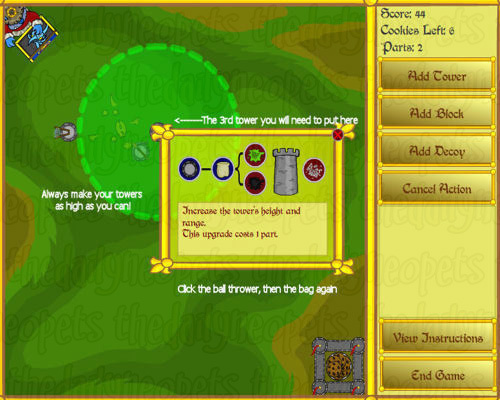 Just like the previous tower we want to click on the ball thrower then the bag thrower again. Place the next tower across from your net thrower. The tower with the green box around it is the correct placement for this new tower. Now the tower placed next to the crossbow needs upgraded as soon as enough parts become available. Upgrade it to the green sludge to help slow down the waves that keep growing stronger! Now upgrade the 4th tower you place to a ball launcher. This will help weaken the soldiers which helps the crossbow kill them a little faster! As soon as you can, upgrade the newest tower to a cannon, and then to the rocket launcher. The rocket launcher can do great damage when it hits in the right spot! Now remember the tower you placed next to the crossbow? You need to upgrade from the green sludge thrower to the windmill. 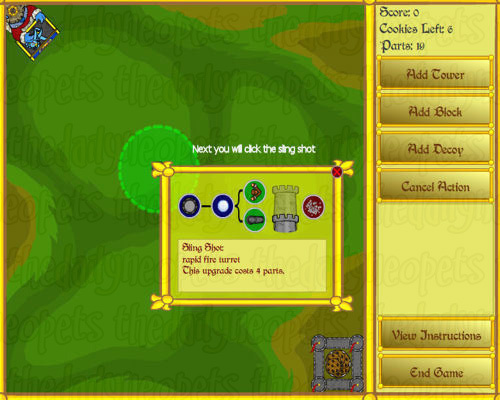 The windmill pushes the enemies back with puffs of air. I find these to be extremely helpful! Now the next tower should be placed in between the crossbow and the net thrower. The green box in the picture is the correct placement. As soon as parts become available make this another crossbow! And you are probably starting to think this will never end….don't worry it does eventually! Now you should place another tower between the rocket launcher and the windmill. The green box in the picture shows correct placement. You should also make sure all your towers are upgraded to the highest height possible. Now you need to upgrade your newest tower to a rocket launcher when you have enough parts. Don't forget to make the tower as high as you can! Next place a tower in between Skarl and the rocket launcher. This helps stop the enemies from escaping shortly after coming out of the box! The new tower should be made into a bag thrower, then to a oil thrower, then to the water thrower. The water thrower looks like a balloon and is circled in the picture. Remember this can only be done once you have enough parts again. Now you need another tower for the same reason you had one on the other side. 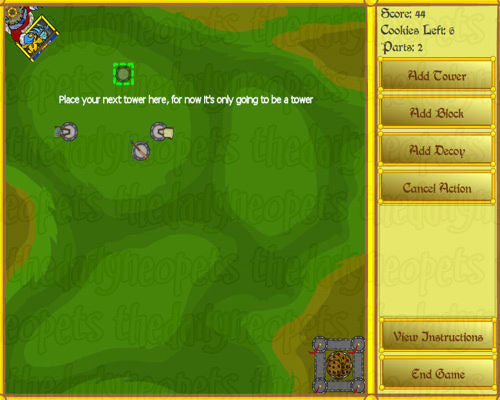 This way those little soldiers can't sneak through right away and steal your cookies! 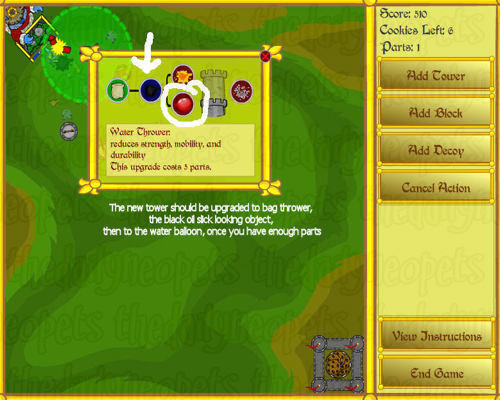 The circled tower should be made a net thrower. Then where the green boxed tower is…that's where you will be putting your next tower. This one needs upgraded into another wind tower when you have enough parts to do this. Keep in mind you may not have the same timing as me with your soldiers; I may get my towers up faster or slower than you. But try to get it done as fast as you can! The new towers with the green boxs around them are being placed in gaps. If you do not fill in these gaps the soldiers can slip through to your cookies! I try to use mostly rocket launchers and crossbows for this, they are the most effective in my opinion. Now see where the green box is? I am putting a new tower there because I didn't fill in that gap and a soldier got through. See how my cookies have gone down? That is why! Darn little soldiers! So make sure you fill in those gaps! 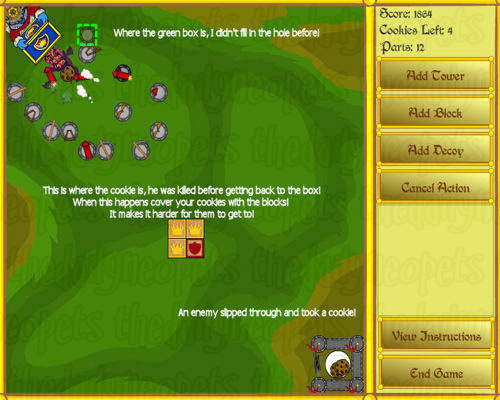 Also, one enemy was killed while carrying a cookie back. See those blocks in the middle of the picture? That is where he was killed and the cookie was dropped. This is when I use blocks. Cover the cookies that are dropped with four blocks. This way it is more of a challenge for the enemies to get to them if they slip by again! Another enemy slipped through! 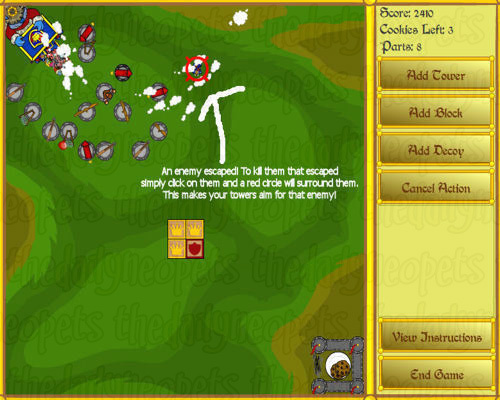 Click on any enemies that do slip through and the nearest crossbows or rocket launchers will aim to that enemy. See how there is a red circle around the enemy? That is how you know they are selected and they are the target. This guide is just meant to show you one possible way to get through the game. Remember to surround Skarl the best you can leaving few gaps! The less gaps you have the better chance you have to keep all your cookies. On a side note, you can add a tower of your choosing closer to your castle. That way if a soldier does escape you can destroy them before they do steal a cookie.